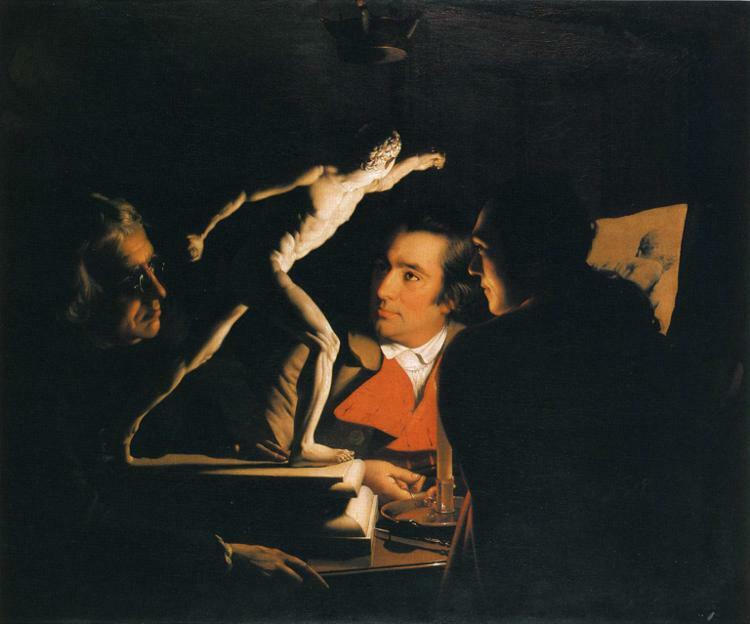 Joseph Wright (of Derby), Three Persons Viewing the Gladiator by Candlelight, 1765, oil on canvas, 101.6 x 121.9 cm, Private collection. WikiArt. Even in shallow views, shadow can be a strong cue to depth. In the development of painting, these two did not start to appear until the Renaissance. The processing of visual data to form texture maps is very complex, and relies on high resolution information in the image. If there are optical defects of vision – such as myopia (‘short sight’) – which result in image blur, this information may be lost, degrading or losing texture maps. This explains why, unless properly corrected, most people with short sight find it more difficult to judge distance. 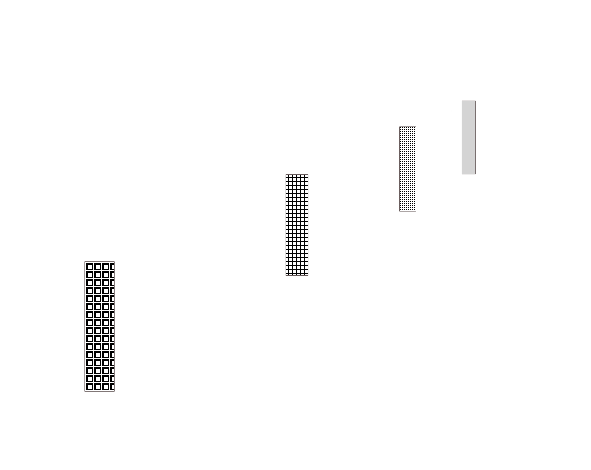 Textures are resolved as part of the process of object recognition, and is highly contextual. Fine strokes of light and dark green in the foreground might be recognised as blades of grass, which in the middle distance are seen as lighter and darker green clumps, and in the far distance as more evenly green areas, for example. If we were to see fines strokes of light and dark green in the distance, they might be recognised as high stands of palms instead. Gerrit Adriaensz Berckheyde, The Bend in the Herengracht near the Nieuwe Spiegelstraat in Amsterdam, 1672, oil on panel, 40.5 x 63 cm, Rijksmuseum, Amsterdam. Wikimedia Commons. 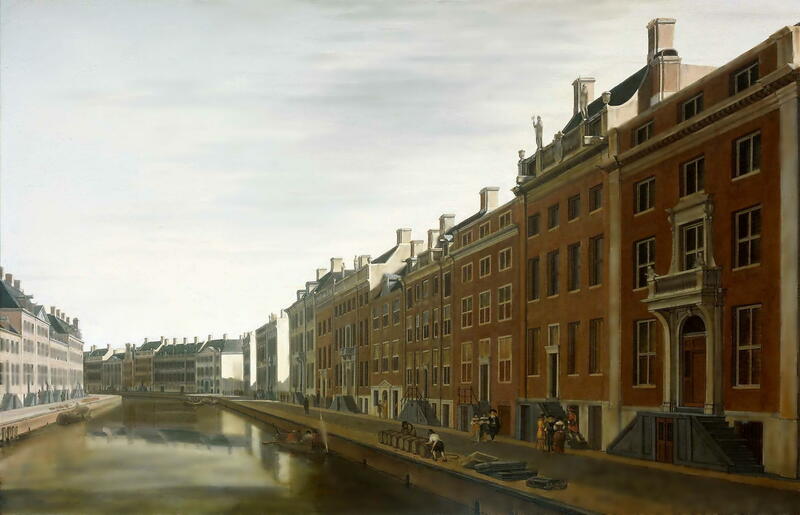 Gerrit Adriaensz Berckheyde, The Bend in the Herengracht near the Nieuwe Spiegelstraat in Amsterdam, 1672. Texture has been blurred out here, showing a reduction in perceived depth. Buildings, with their regular surface structures such as windows and doors, and textured materials such as brick and stone, give particularly rich clues as to depth and space. Even when you strip out other visual cues to depth, differences in texture can start to give an illusion of depth. 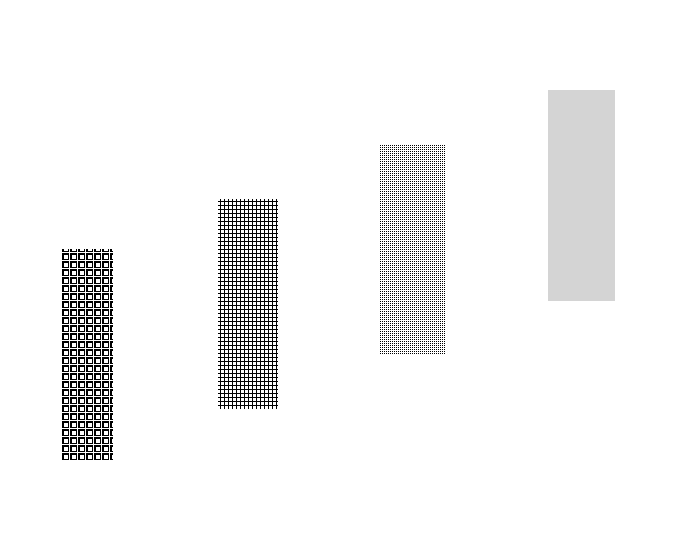 However this is not a strong effect, and texture and detail changes are normally an adjunct to the more important cues, such as overlay, relative size, and height in the picture plane (1, 2, and 3 in the list above). The combination of height in field of view combined with a texture gradient gives some suggestion of depth. With additional depth cues, a texture gradient enhances the impression of depth. Paintings in which additional textures are produced by brushes and painting tools pose additional complications, because the textures and details perceived include those made in the paint. As I pointed out in the first article in this series, Cézanne’s ‘constructive stroke’ is a good example of conflicting information resulting in apparent loss of depth in paintings. If the marks in a painting are to be visible at the intended viewing distance, then care should be taken to match the size and resulting texture of marks with the natural textures in the depicted image, if depth is to be preserved. This was understood by those using Divisionist or ‘pointillist’ techniques in the late nineteenth century. 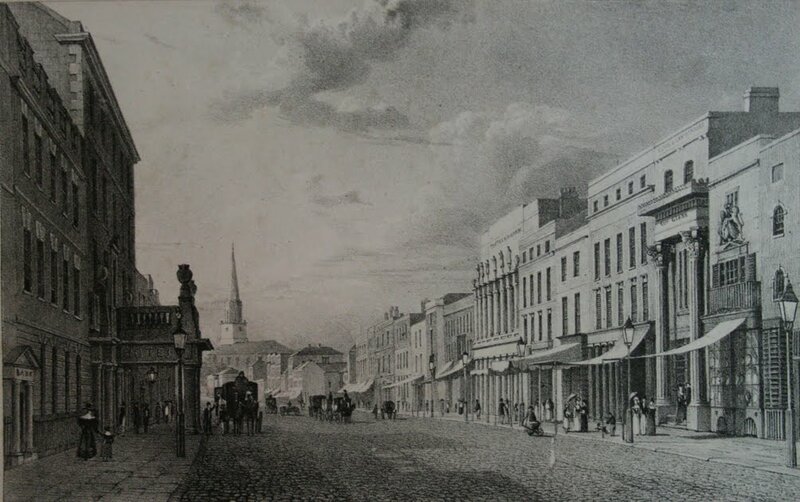 New Street Birmingham, c 1825, engraving. By Henry Harris, via Wikimedia Commons. Careful use of texture in this engraving provides good cues to depth. Another situation in which an artistic image may result in conflicting cues is in printmaking, where lines and other marks of ink in a print are used to depict shading and colour. Many older engravings, including Hogarth’s parody on perspective shown in the second article, do not vary the density of marks to assist with cueing depth, thus appear flat. 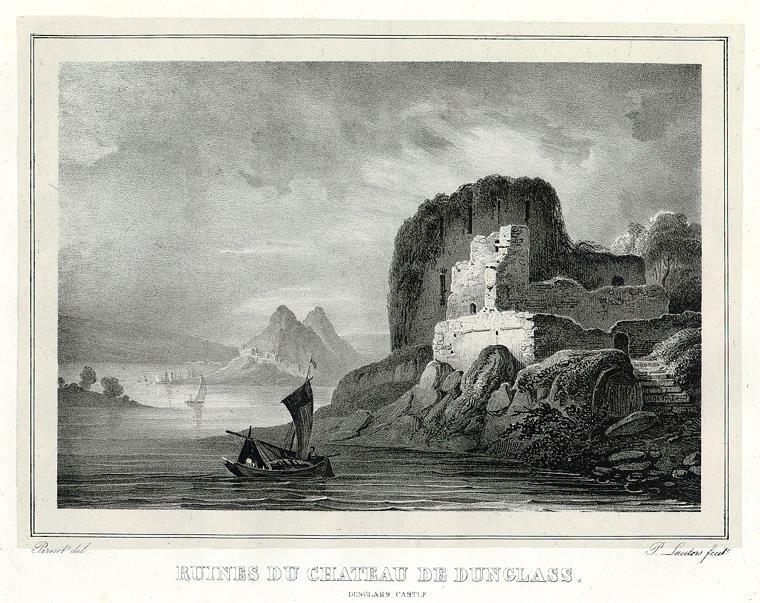 Dunglass Castle, engraving. Drawn by F.A.Pernot and printed by A.Dewasme, via Wikimedia Commons. An engraving with careful texture gradient, adding depth. Some media can be quite tricky to produce variable textures in, unless a great deal of time is spent making marks. Watercolour washes, for example, can contain texture when they granulate, but imparting a gradient in granulation whilst retaining even lightness and chroma is fiendishly difficult. 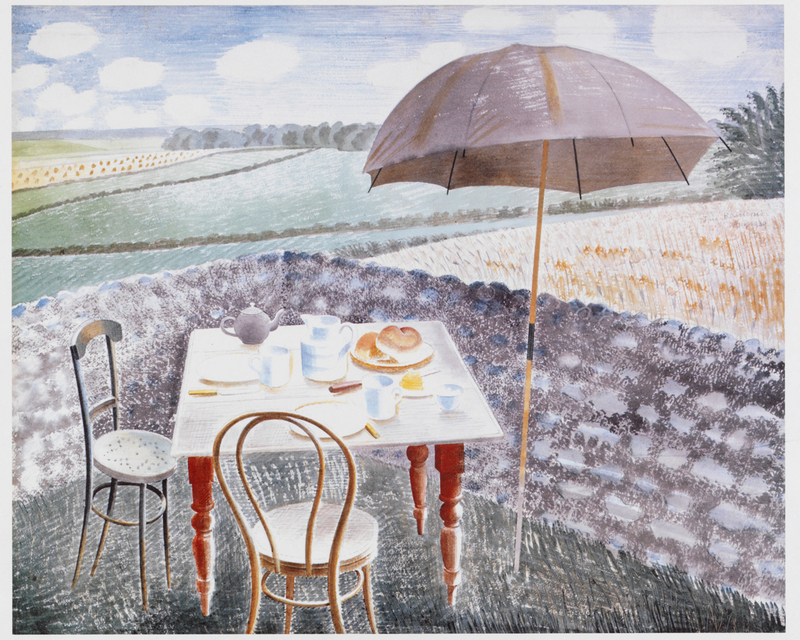 Painters with a printmaking background, like Eric Ravilious, devised ways of making rich textures, although most appear to require more time than would be available plein air, for example. Sadly the result is that most plein air painting cannot take advantage of the cues from texture gradients, although there are some wonderful exceptions. Eric Ravilious, Tea at Furlongs (1939), watercolour and pencil on paper, 35 x 43 cm, The Fry Art Gallery, Saffron Walden, England. Wikimedia Commons. There are various and varied conventions over terminology: here I will simply refer to those shadows resulting from an object’s three-dimensional form which fall on itself, and cast shadows, which are the shadows caused by other objects but fall elsewhere. Shadows falling on the same object are classical examples of very strong cues to the shape and depth of the object, and are detailed in all good books on drawing. They are often the only features which enable the brain to transform an area of colour into a proper 3D object. Paint the stem of a tree with uniform lightness and chroma and it will inevitably appear to be a flat surface; put even the simplest highlights and shadows in and it will immediately be perceived as being cylindrical in form. 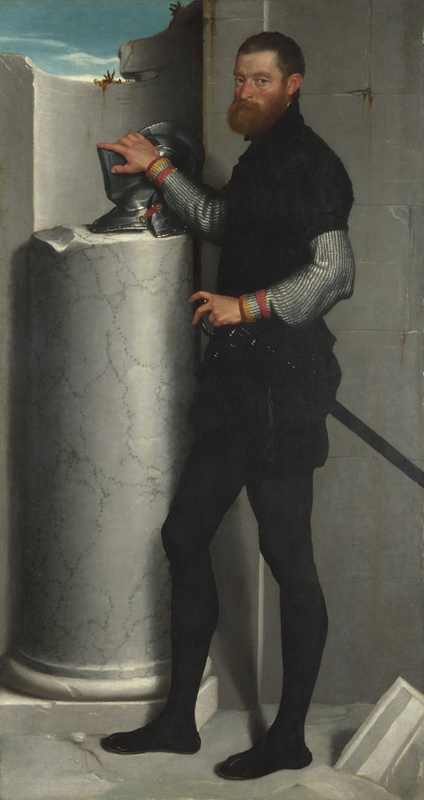 Giovanni Battista Moroni, Portrait of a Gentleman with his Helmet on a Column Shaft, c 1555-6, oil on canvas, 186.2 x 99.9 cm, The National Gallery, London. Wikimedia Commons. Shading on the column makes it appear cylindrical, adding depth. Robert Campin, The Trinity of the Broken Body, 1410, grisaille on panel, 147.5 x 57.6 cm, Städelsches Kunstinstitut, Frankfurt am Main. WikiArt. Shade and shadow transform this grisaille to appear strongly three-dimensional. Shadows cast on other objects can strengthen depth cues considerably. One obvious way in which they are used in the brain for this is when zones of shadow and full-lit areas divide the image into multiple planes, as shown here, where they play an important part in working out depth order. Although more complex and open to misinterpretation, the complex forms of cast shadows also enhance the perception of depth, and sometimes may be the only cues to the form of certain objects. 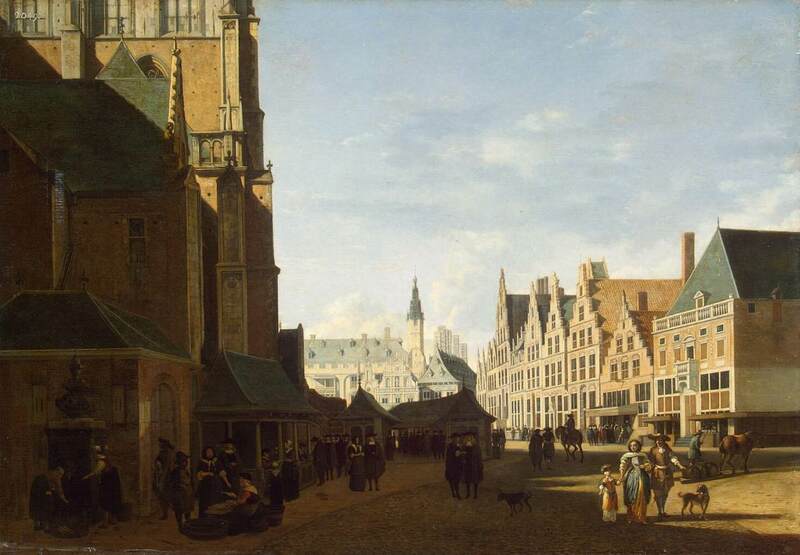 Gerrit Adriaensz Berckheyde, Groote Market in Haarlem, Amsterdam, 1673, oil on panel, 42 x 61 cm, Hermitage Museum, St Petersburg. Wikimedia Commons. Shadows give strong depth cues. Cast shadows are often the last elements to be added to a painting, and are readily forgotten when a plein air painting has overrun. Although that is seldom a disaster in itself, it can result in shadows being hurriedly painted in at the very end of the outdoor session, when they may be quite different from others which were painted in earlier. It is worth including them in a mental checklist of things to do before signing a painting. Fortunately omission of shadows is less often noticed than most painters fear. However marked inconsistencies in shadows can be very easy to notice, and should be avoided at all costs. Posted in Painting and tagged 2D, 3D, depth cues, depth order, detail, painting, perception, perspective, shade, shadow, texture, visual space. Bookmark the permalink.